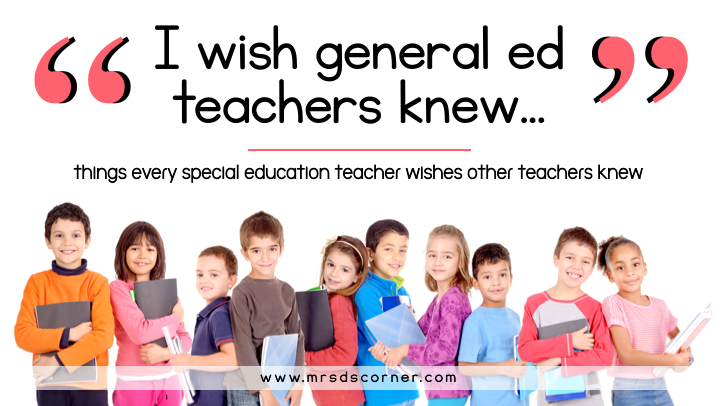 Dear general education teachers, there are some things that we special education teachers would like you to know. Let’s start by saying that we love working with you and we love that you are part of our student’s team. The more hands on deck, the better. The more brains, the better. But there are some things we would like to clarify. Our students are not that different from your students. Our students are capable. They are smart. They understand so much more than you think they do. And to piggyback on that, our students are capable of high level learning and achievement too. It might not look the same as what the regular ed classroom is doing, but our kids can do it. Give them a chance. IEPs are legal documents that you must follow, and not just when you feel like it. Accommodations are also a part of the IEP… so you have to provide them at all times. Accommodations do not make our student’s work easier. If you don’t understand a part of a child’s IEP or if you have questions, please ask us. We want you to understand it and understand how to implement all of its parts. That also means that if a child with an IEP is in your classroom for any part of the day, that child is YOUR student too. And we are a team, so we need to work together. Together we will help them succeed. They are OUR students. This goes for including parents in classroom emails and celebrations too. Our kid’s parents want to be involved just as much as the other student parents. And this should go without saying… but our students want to be included in your classroom too. Please stop forgetting about them. Our caseload may be small, 4 … 8… 13 kids, more or less, but we have the same amount of paperwork and responsibilities – if not more paperwork. We are teachers too. In fact we are a highly qualified teachers, just like you are. Don’t doubt us or undermine us. However, our job is to support the students in your classroom, not your lesson plans. We have standards to meet, lesson plans to write, and district mandates to follow just like you do. We deserve our planning period and lunch time just as much as you do. Just because I don’t have students in my classroom when you walk in, doesn’t mean I’m getting a break or that I’m not working. Also, just because we have paras doesn’t mean our job is easier or that we have more help. Support staff are assigned to our classroom to help each child get the individualized instruction needed throughout the school day. We are expected to manage the other adults in our classroom. Yes, we absolutely could do function without our paras, but we also spend a lot of time working with our paras. We don’t play all day, and we’re not babysitters. We collect data. We teach functional life skills so our students can be and are independent. We use alternative curriculum to meet the needs of all of our students. We differentiate every single lesson to meet the individual, specific needs of our students. Yes, I love what I do whole-heartedly. But my job title is TEACHER, not magician. There is no magic wand to “fix” a child. We are teachers just like every other teachers. Our job just learns and operates a littler differently, that’s all. Just as respect is earned with adults, it works the same with our students. Show them respect and you’ll get respect in return. Trust me when I say that Student A knows you don’t like her. So you’ve met one student with behaviors… which means you’ve met ONE student with behaviors. That does not mean that every child with an IEP has behaviors. Don’t carry a jaded perspective from one student onto another student. The two are unrelated. Treat them as individuals and do not generalize or profile them. Do not talk about a student in front of him or her. A majority of our students are very well aware that they are behind their peers, yet everyday they get up and show up to grow their brains and bring happiness to others. We get it, some students are difficult… and it can make your class harder to manage with the addition of one student. We really do understand your frustrations, but it’s all about building relationships. We need to follow proper procedures to get students special education services. Don’t promise parents resource room help before we test or before you’ve tried your own interventions. When I take the student out for Resource, they’re not “losing” instruction time. We do work in my room. We work on goals, plus some. They’re getting individualized instruction that best HELPS them in my room. The students are not “my” students… they are YOUR students and I am a resource to support them! As a resource room teacher: I work with 10-15 different teachers/schedules on a daily basis. I can’t change my schedule around as easily as you can. At the end of the day, the ultimate goal of special education is dismissal from the program. While special ed services may be needed as a long term program for some students, its not needed for all students. Enjoy OUR students. Love our students. Treat our students with respect, and hold high expectations. They can and want to learn from you, with you. What do you wish other teachers knew about your job? Your students? Your classroom? Tell us in the comments below! « Progress Monitoring: I Took Data, Now What?! This is an amazing post. As someone who is studying special education, one of my greatest fears is feeling unincluded or not respected by the regular classroom teacher. I think it is important, and you did a great job explaining it, that regular education teachers understand all the effort that goes into teaching students with learning disabilities. While you have fewer numbers of students in your class at a time they require much more attention and much more paperwork as well. Your job is SO important and you are helping your students progress and be functioning members of society. I wish gen ed/sped teachers could work schedules so that resource room is during replaceable time, like library visit, tech ed, or reading/writing practice rather than direct instruction. Thanks. This is perfectly stated-love all the ideas. Thank you! I wish they understood that the self-contained classroom in not a dumping ground for behavior issues. That just because it looks like my students are playing, I am teaching them they way they learn. That just because my lesson plans say I should be doing this at this time, my students needs and behaviors for that day can dictate my activities. Just because my students can have some behaviors, at times, they still want interaction with their peer and you. Don’t be afraid to step in my room for more than 2 minutes. Great things happen in here and every moment if filled with great learning opportunities for my students. They learn differently and may have different needs, but they are teachable. Love LOVE this comment! I couldn’t have said it better! After 20+ years of teaching special education this is one of the best articles to share with general education teachers. I was very fortunate to work with an amazing staff that supported my role and the students on my caseload. This statement…”The students are not “my” students… they are YOUR students and I am a resource to support them!” was one of my soapboxes. Inclusion teaches so much more than any teacher trying to teach the lifelong skill of being a responsible citizen in their community. Thanks for sharing these notes that all teachers need to say and hear. As a K-2 AU self contained teacher I would like my fellow teachers to please quit saying “i don’t know how you do it”. I know my classroom can be loud and there can be a bit of confusion but it is not sacrifice to work with my kids. I am a teacher just like you! I love this and would love my general education co-workers to know all this. I wish I had a caseload of 6,7 13…..mine in currently 58, UGH. I teach 6 classes a day and have only 1 prep period, I am case manager over two schools and give up my lunch often to test kids for 3 years as I never have time to do it otherwise. (It is my choice to do this). I love my job and I love my kids and will do anything for them. Thank you for this well stated blog. It Is confirmation and encouraging in more ways I can express. For many of those who responded I too feel every child despite their label or what type of class they sit in most of the day should be welcomed and dignified by all but especially their grade level Gen Ed teachers.